If you want to know how to help a hoarder, you must first appreciate the fact that hoarding is a mental disorder. Hoarders are not lazy, dirty people. A dump truck or bulldozer won’t solve the problem! If someone you know and love is a hoarder (or has hoarding tendencies) it can be tempting to take over and declutter their belongings in an attempt to ‘fix’ the situation. Or worse, you try to convince them that they should listen to your well-meaning advice and simply stop hoarding. Unfortunately, this approach is almost guaranteed to backfire. Disclaimer: I am neither a doctor nor a mental health professional. Please do not take the information contained in this post as medical advice. If you or someone you love suffers from hoarding disorder, I urge you to seek treatment today. Before you can help a hoarder, you must first have a good understanding of what hoarding disorder is (and what it’s not). How to help a hoarder: what is hoarding? A person who suffers from hoarding disorder will often fill their home to the brim with clutter (and sometimes trash), limiting access to key spaces needed for sleeping, cooking, and personal hygiene. In extreme hoarding cases, the hoarder’s home will become so overtaken by clutter that the only way to move about their home is by ‘goat trails’ (small pathways amidst the clutter). Treatments for hoarding disorder include cognitive behavioral therapy, medication, working with a professional organizer or hoarding specialist, and ongoing support from family and friends. In cases of extreme hoarding when safety becomes an issue, Adult Protective Services may need to be contacted. It’s important to note that hoarders are not collectors. While extensive collecting certainly has the potential to become hoarding, there a few glaring differences between hoarding and collecting. A collector, for example, will tend to display their treasures in a clean, organized fashion such as display cases and shelving systems. In addition, someone who collects will stay within a pre-assigned monetary limit as to avoid overspending. Also, a healthy collection will not interfere with movement throughout the house. Conversely, hoarders tend to create random, meaningless piles around their homes which frequently impedes mobility. Also, many hoarders don’t exclusively hoard trash. On the contrary, a lot of hoarders posses items of value, however many times these items are misplaced in their hoard and/or treated poorly. Hoarders attach emotions to items. By letting them talk about why certain items are important to them, you can help them realize the emotion is in the memories, not the physical item itself. Acknowledge the fact that some items in a hoarder’s home may actually be valuable, but that they are not being treasured if they are buried in unnecessary/less-valuable items. Instead, say “I will help you part with things as long as you feel comfortable doing so.” *Always ask for permission to touch a hoarder’s things. Hoarding is almost always about control. Someone who hoards may feel as though their life is spinning out of control. As a result, they seek to control their life by protecting their hoard. Compulsive hoarding is an irresistible urge to accumulate stuff. A hoarder cannot simply ‘flip a switch’ and stop hoarding. Treat a hoarder as you would like to be treated. With love, kindness, and understanding. Encourage them to seek therapy for their condition. Don’t make it personal. Shift the focus away from the person and onto the hoard. Discuss the safety/health aspects of living with a hoard. Focus on creating a safe space for a loved one with hoarding disorder. Attempt to convince them to allow you to help them declutter only the spaces needed for sleeping, cooking, and bathing. It’s important to remember that hoarding disorder is never about the stuff. Rather, it is about the (perceived) value hoarders place on objects whether they are useful or not. A person living with a hoarding mentality often is incapable of rational thought when it comes to their belongings. Which is why it can be difficult to impossible to reason with a hoarder. 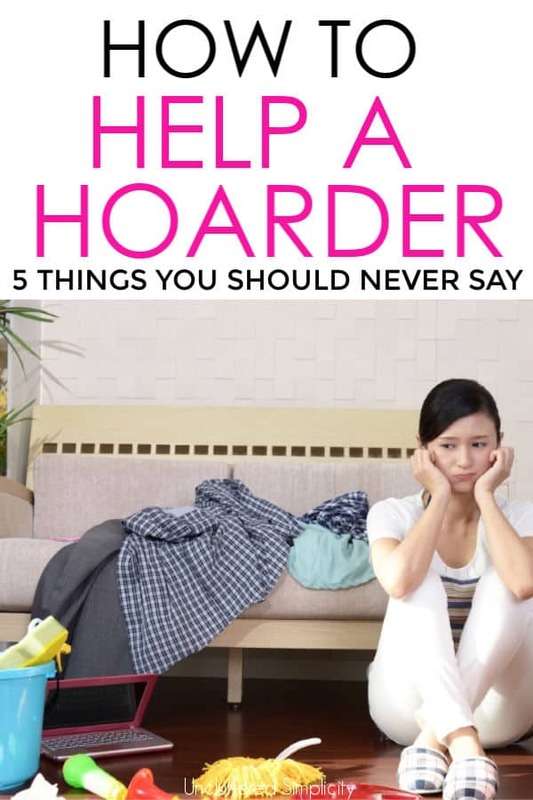 Arguing with a hoarder is never a viable solution to get them to declutter. Many hoarders are very intelligent/well-educated people and know what to say to win an argument! The best way to interact with a person how suffers from compulsive hoarding is with kindness, gentleness, and compassion. Remember…hoarding is a recognized mental illness. It can be an extremely stressful and emotionally draining experience to live with and/or care for a person who suffers from hoarding disorder. Which is why you need to focus on managing your own stress/mental health before you attempt to help them. If you suffer emotional/physical abuse at the hands of a hoarder, call the authorities and remove yourself from the situation immediately.